Chicken tenders bring me back to my childhood. They’re a fun, hand held, dip-able dinner. That really is the best part right? You get to dip them in so many sauces. When I was a kid, I would always try to get one of each sauce to dip my chicken nuggets in. Yes, one sauce cup per nugget/tender. Anyone else out there a sauce enthusiast? Anyway, this is my favorite honey mustard dipping sauce. Its zippy with just the right amount of sweetness. The chicken tenders are my basic recipe, but feel free to change up the spices if you like. 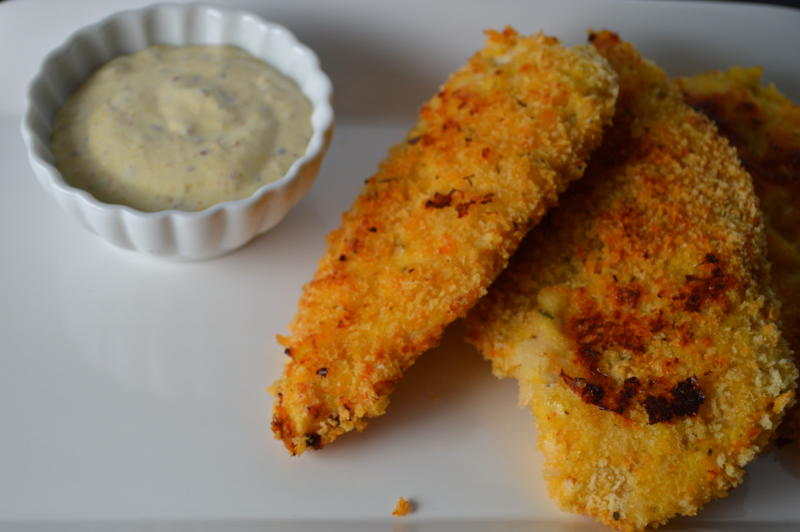 I usually add some Parmesan cheese to the breadcrumbs to give the tenders a cheesy flavor. It also helps them to turn a nice golden brown color. You can also add a side of ketchup, bbq sauce, ranch, buffalo sauce… the more the merrier. Set up the breading station using three shallow bowls. (Or one bowl and a large sheet of foil for easy clean up) Beat the egg with dijon mustard. In the next dish add the flour and season with salt and pepper. Next, mix the remaining spices with the panko breadcrumbs. Season with salt and pepper. First, dredge the chicken in flour, then egg, then breadcrumbs. Make sure to shake off the excess between steps. Place the breaded chicken on a foil or parchment lined and cooking sprayed baking sheet. While the chicken is baking, make the honey mustard. Mix all ingredients together. Taste and adjust seasonings. You may need to add more mustard depending on the brand you use and how strong you prefer it to be. 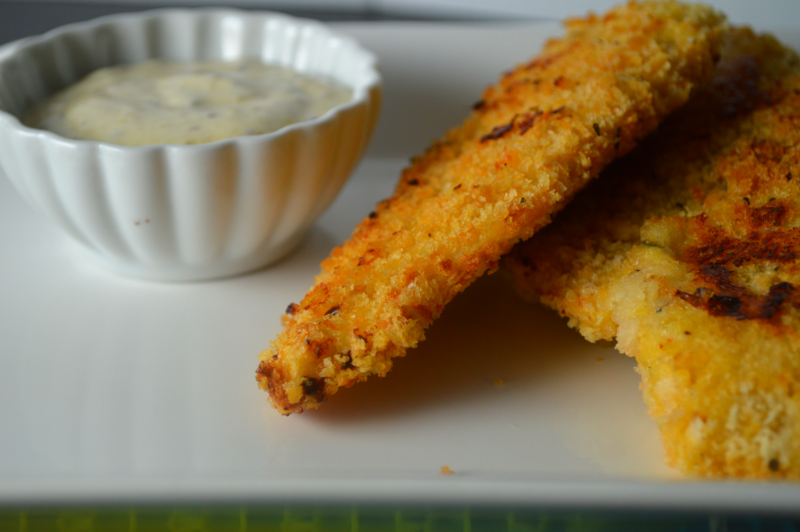 I love the idea of mixing panko with italian bread crumbs, flavor plus that awesome crunch you get with panko. Sweet and sour was always my favorite sauce, do you have any ideas on how to make a homemade sweet and sour sauce?